So it's been almost two years since I've made any dreads, and it's been even longer since I've made any transitional dreads. Not that I was ever awesome at it or anything. 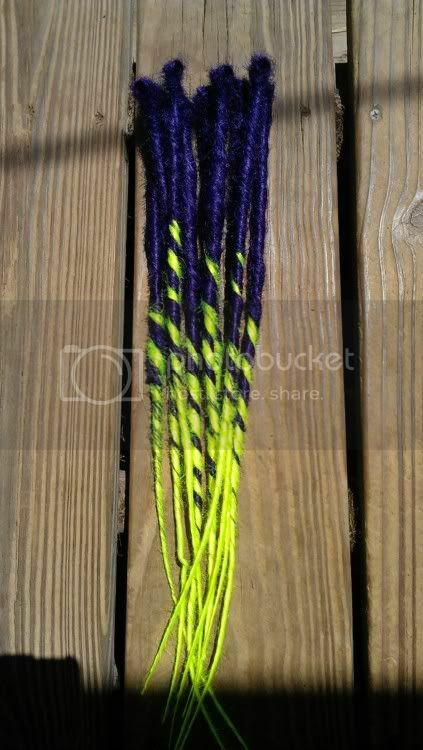 Anyway...They're dark purple and "neon green", which in my opinion looks freakin' yellow. Just figured I would get some opinions. Feel free to critique. Lovely. The one on the left looks a bit lumpy, but it's been awhile. I'm sure it wI'll come back to you. I like the color combination! Other than the lumpy left one, I would say just to watch out for over-twisting it to the point where it doubles up on itself (second from left). I would also suggest to observe how your transitional, well, transitions. Some of them have a more splashed-transitional look, whereas the one in the middle has a very candycane/swirled look. They do look good, though, and your rustiness is quite nice! I wonder what you can do with more practice! I love the colors, they are awesome!